Poor attic ventilation in your home is a recipe for disaster, affecting the integrity and aesthetic appeal. Moisture is a part of everyday life between showering, cooking, and running appliances, and where does all that warm, humid air go? Straight up into your attic space. If there is no proper attic ventilation, the trapped moisture is forced to permeate the roof decking and rafters which results in a sagging look and premature aging of shingles, speeding up the time in which you will need to replace your roof entirely. Having adequate ventilation in your home is key to preserving the integrity and longevity of your home. 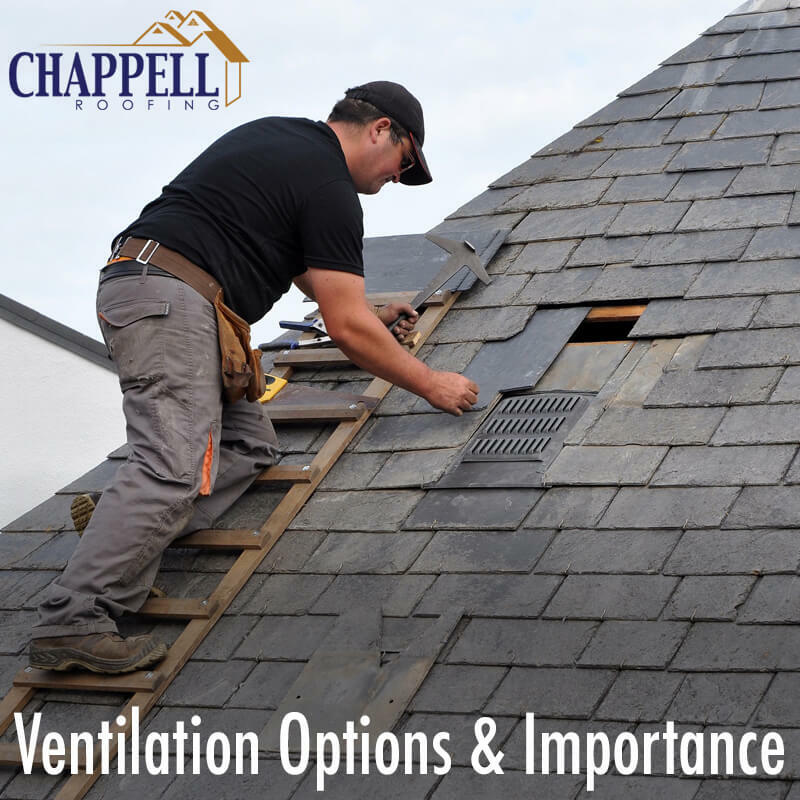 There are many different types of ventilation systems to suit every home type. Relying on wind velocity, these are exactly what their name says: stationary. These fixtures sit on your roof, have no moving parts, and the air is simply sucked out of the top by the wind passing by. This type of ventilation is popular due to the fact that it is not quick to wear out. Due to its static nature, most of these vents do not need to be replaced until your home is re-roofed, making this a quick and affordable option for homeowners. Similar to stationary exhaust vents, these fixtures also use wind velocity of at least 5 mph. Because these have moving parts and are slightly larger, these are able to pull twice the volume of air in the same manner. Wind turbines should be inspected often to ensure all parts are spinning effortlessly and if they are not, they need to be replaced as they aren’t effectively ventilating your attic space. While not a ventilation method in and of itself, it aides in air ventilation, pulling cool outdoor air inside your home, helping keep the environment moisture-free. These need to be used in conjunction with one of the methods listed above, but especially for the next method of ventilation on the list. Solar attic fans are the most effective way to ventilate your attic, but require additional soffit vents in your home to amp up your cool air intake. Solar attic fans make your rooftop look cleaner, reducing your need for many vents. A solar attic fan is equal to 10-12 louver style vents while moving five times more air than a static vent all while relying on solar power. Contact us today for all your roofing and ventilation needs near the Midland, TX area.